Mornings are by far the most hectic time in my day. I love it when I stumble upon a fast breakfast recipe. 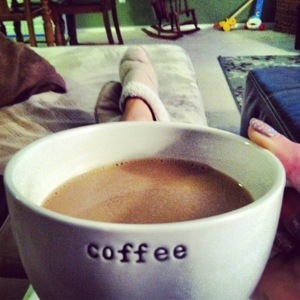 I am always looking for ways to give myself a few more minutes of sleep or simply time to enjoy my morning coffee before dropping my son off at the baby sitter and going to work. Sit back, relax, and enjoy your mornings. These carb-free frittatas are delicious and incredibly fast, easy, and inexpensive to make. 3. Sprinkle ingredients of your choice in each muffin tin. Think omelets! 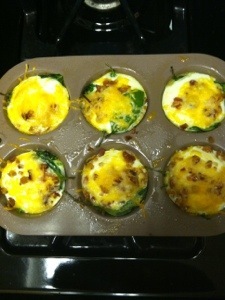 I love spinach, bacon bits, and shredded cheese. 4. Crack 1 or 2 eggs into each muffin tin. You can also scramble eggs and pour into tins. I make these on Sunday afternoons or evenings. Once cooled, I place the frittatas in a storage container in my fridge. My family can then grab one or two and microwave them for 30 secs to reheat. What are your fabulous, frugal, and fast breakfast recipes?